Libraries and museums across the United States are building youth maker spaces and programming in an effort to broaden free, community-embedded educational opportunities. However, the tech enthusiasts who are championing the programming comprise a small percentage of library or museum staff. Many remain skeptical or unconvinced; they may already be stretched too thin in their job, or they may think of 3D printers as a fad that doesn’t relate to traditional librarianship. I discovered that teachers at the Darunsikkhalai School for Innovative Learning (DSIL) in Bangkok, Thailand expressed the same concerns as librarians in Philadelphia, when I visited last week with researchers from Stanford University’s Transformative Learning Technologies Lab (TLTL). 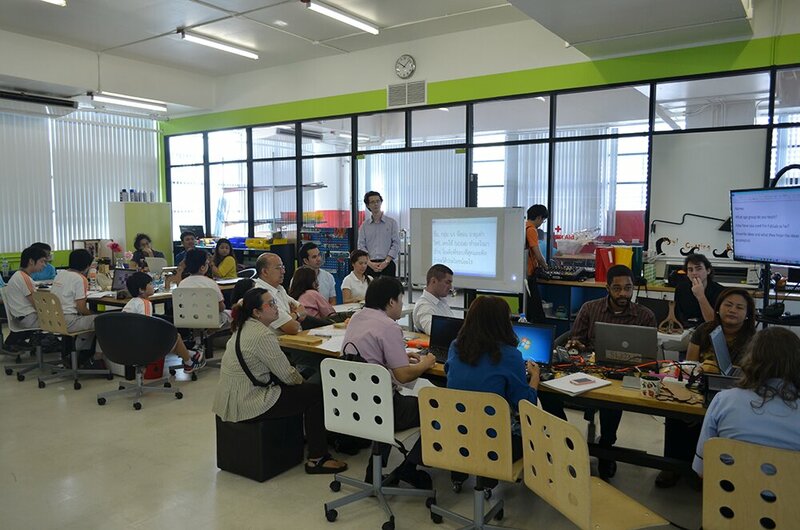 The 3-day workshop introduced teachers to the tools in the FabLab through a project-based approach, and I met many teachers who had concerns about the FabLab’s relevance to their own curricula. The workshop helped to alleviate many of their concerns, and enabled them to see how the FabLab could be used as a tool to enhance their classroom. At the Free Library of Philadelphia, we are running a similar 1-day workshop with the staff of our North Philadelphia Cluster (about 60 people), in an effort to introduce all levels of staff to maker programming. This staff development is valuable, as it helps to demystify new technology and programming in a short amount of time with a high amount of impact. DSIL, a school with approximately 100 students, is very progressive—particularly when compared to the typical classroom in Asia. There is no grading system and no grade levels, only three categories: New Learner, Intermediate, and Advanced. Every term youth at DSIL do a course called Project where they create an object or a report through self-directed inquiry. The only rules are that the projects be feasible in terms of time, and in the words of one teacher, “academic enough”. Through Project, youth work creatively and independently, and are mentored by teachers as they discover their own interest-driven pathways. Project is modeled on the learning theory of Constructionism, most easily defined as learning-by-making. Constructionism shares many threads with Connected Learning (interest-driven, production-centered) and offers a useful model to libraries and other informal learning spaces experimenting with maker programming. DSIL’s FabLab, part of the FabLab@School network, was inaugurated in January 2013 with programming beginning in March 2013. It is developing at the same rate as maker programming in Philadelphia and at other Learning Labs. As I spoke to teachers, we discussed some of the bigger questions they had, which I have heard often in the U.S. amongst libraries and museums: what sorts of programs best support youth as they’re pursuing the kernel of an interest? Through making, what is our goal in teaching youth? What sorts of tools and guidance need to be available to help youth learn this independent, interest-driven creative thinking and process? The workshop began with youth and teachers describing what they’ve previously used the FabLab for, and the obstacles they have had integrating the FabLab into their curriculum. One teacher, Plub Limpiti, teaches “New Learners” who are around 9-10 years old. She had no experience using the FabLab’s tools (e.g., the laser cutter, 3D printer, vinyl cutter), and felt that her students lacked hand skills. Her class had previously used the FabLab to create wire armatures, onto which they would glob clay; an exercise that the students got quickly bored with. She was hoping to leave this workshop having developed interesting, easy-entry, low-tech ways for her students to use the FabLab. Another teacher, Archie Silapiruti, teaches “Advanced” students ages 13 to 18. 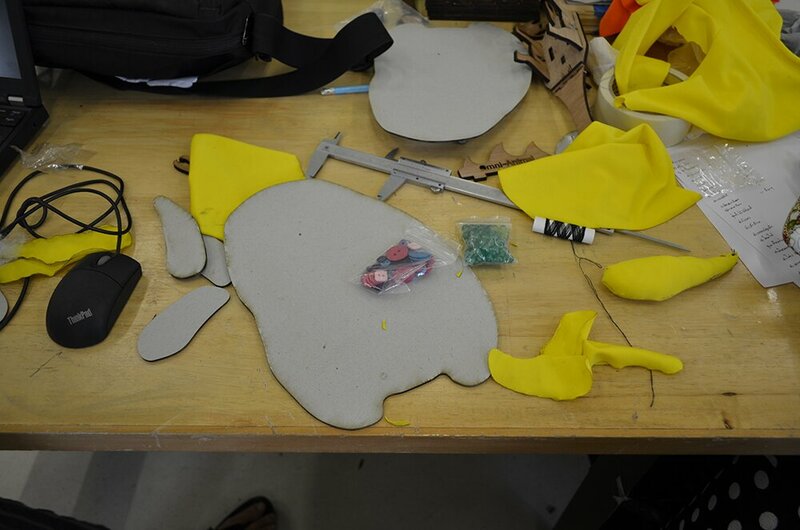 Like Plub, he had no experience using the FabLab’s tools. 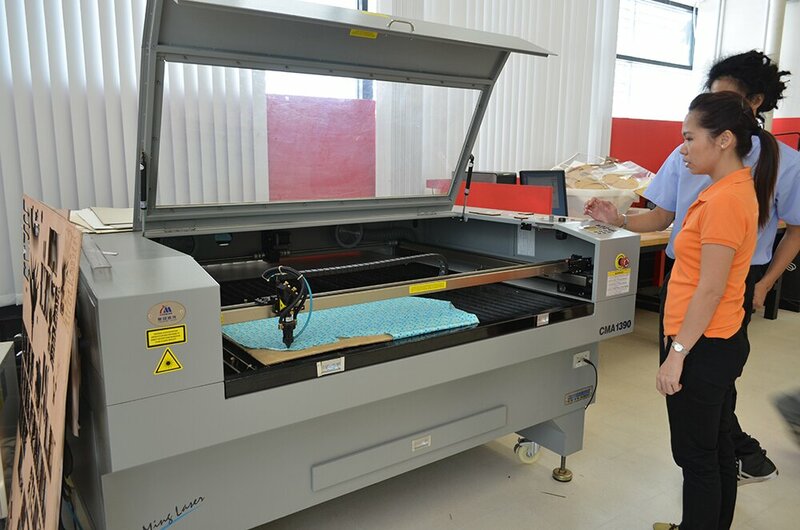 The younger students (equivalent of 9th graders) are what Archie refers to as the FabLab Generation; when beginning a project, their default is to start immediately in the lab and use the laser cutter as much as possible. Many do not seek help from Archie or Pump, the Lab Manager, because they don’t “want to be bothered” while they’re working and prefer “to do thing own thing.” Often, Archie’s students use the lab outside of class to create mechanical objects, like engines, airplanes, and motorcycles. 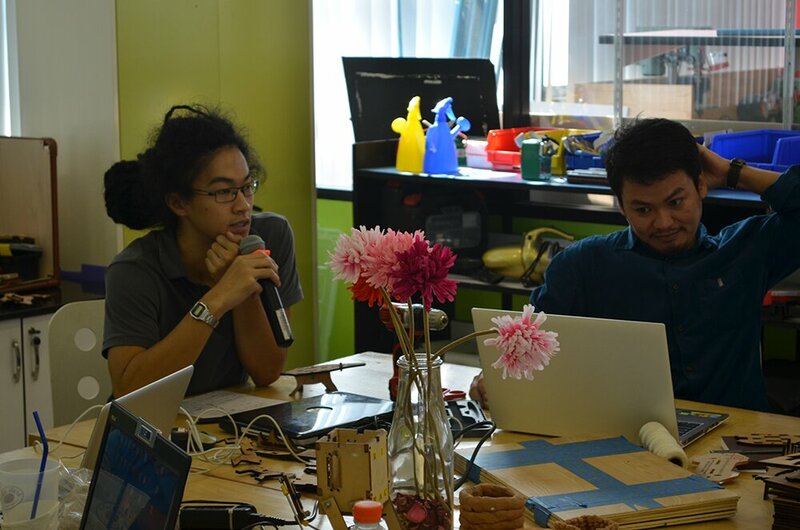 Most of these younger students using the FabLab are male, which reflects that makeup of the school (the school is currently “mostly male” according to Tukta Tutiyaphuengprasert, the Vice Provost of DSIL, but hasn’t always been that way). Archie’s older students, a group that includes more girls, begin their creative process with traditional, low-tech materials like drawings and cardboard cutouts. There’s a rift between the younger and older students; the older students are more focused on doing reports, and are less inclined to use the FabLab. Archie is worried that the older students are being “left behind”. He suspects that they’re intimidated by the FabLab, in terms of tools and objects that other students are making in it. He is focused on boosting these students’ skills by showing them how the FabLab can be used as a resource that’s not limited to a narrow engineering focus. Another New Learner teacher, Michelle, said that she had only used the FabLab to monitor student safety while they were using the tools and equipment. Consequently, she didn’t know how to use any of the tools, and didn’t have time to learn, so whenever the students had questions she would defer to Pump. Her purpose in attending the workshop was to learn more about the FabLab so she could better support her students. In the next part of the workshop, teachers and youth broke up into groups and developed a project they wanted to work on for the next two days. Researchers from Stanford explained the concept of design thinking to the group and then guided them through the process of identifying a problem (empathizing with the end user/community), brainstorming a rapid list of solutions (ideating), prototyping one idea that fits the needs of the community best, testing the prototype, redefining and refocusing your solution based on the community’s response, and repeating the cycle. Each group was to identify a problem that they currently face in their classroom, and use the FabLab to develop a project or a solution. 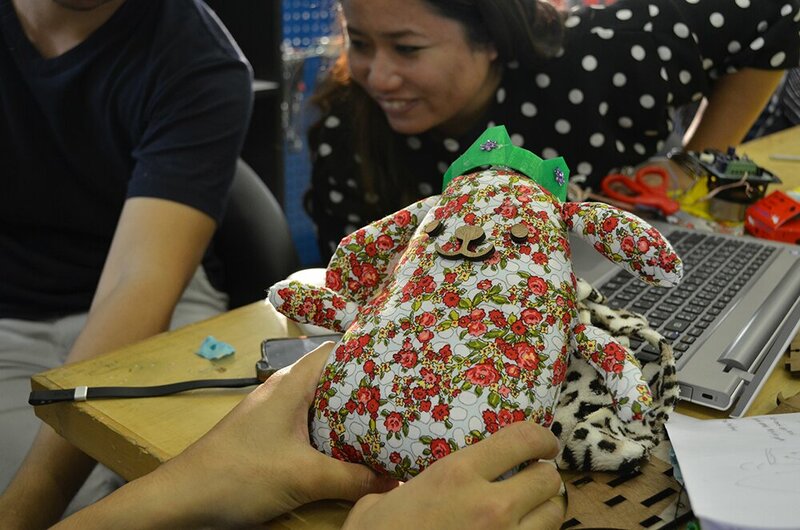 In an effort to introduce youth to the laser cutter who might not be interested in creating an engineering product, Archie and his group decided to create a pattern for a stuffed animal, to be cut out of fabric using the laser cutter. Plub and Pump, whose group I later joined, decided to create a Rube Goldberg machine, with the help of a New Learner student. This would involve a lot of creative thinking, but not necessarily fine handwork and tool use. All groups were, for the most part, learning the tools as they were creating their project. Archie’s group had never used the laser cutter before to cut fabric. Since the fabric is so lightweight, and the laser cutter has a fan inside it, they were concerned about keeping the fabric in place while it was being cut (the solution involved cardboard and pins). They also didn’t know what speed and strength to set the laser cutter to without scorching the fabric. In addition, they had to create a pattern for a stuffed animal from scratch, which they prototyped using paper and glue. At least one member of their group did not know how to sew. Plub’s group had never created a Rube Goldberg machine before. They began by looking up videos on YouTube, and identifying the elements that they wanted it to have (a pulley, a ball, and an inclined plane). “And it has to be pretty” she said, she pulled a fox puppet, ribbons, acrylic tubes, and washi paper tape out of a box of her own crafting supplies. They struggled to get the physics of their project right, and it took a lot of thinking, improvisation, and failed attempts before they were able to successfully combine their individual elements into a string of movement. At the end of the workshop, all of the groups presented their prototypes. Many were excited about both the projects they had created, as well as their new knowledge of the tools in the FabLab, and possible ideas for how to use these tools in their classroom. Despite some initial skepticism of the FabLab from DSIL’s staff, everyone left the workshop with the confidence to use many of the tools, and could decide from that point how to interface their curriculum with this resource. I have heard grumblings at numerous conferences that staff in libraries and museums across the US are stretched thin. One person is often doing the work of three (e.g., working the circulation desk, writing grants, developing/running workshops). Learning the world of 3D printers, robotics, and coding can be intimidating, particularly when one has to do it off the clock. Like the teachers at DSIL, the staff who are least likely to use those tools are the ones who are being left behind. They have a lower sense of self-esteem towards participating in creative technology, which inhibits their engagement and enthusiasm when they see maker programming taking place. This exacerbates the gap between tech-saavy and techno-phobe, and does nothing to improve service to the public. At the Free Library of Philadelphia, where I currently work as a Teen Programming Specialist, we’re looking for ways not only to build and support maker programming directly, but also indirectly, through staff training opportunities like those I experienced at DSIL. On January 2, we’re hosting a staff development day for all staff in our “North Philadelphia Cluster”, from Branch Managers to Security Guards, to introduce them to low-cost, low-entry maker projects, such as e-textiles, squishy circuits, various applications for the MaKey MaKey, our Connected Messages project, which has been ongoing in the North Philadelphia branches, and more. The training will be based on the same model as our Maker Celebration; several tables arranged in a circuit, each with a tool and a mentor to show a few of the tool’s possibilities, and encourage the participant to play. We hope that this casual making session will not only introduce all levels of staff to the making experience, but also create in them the confidence that they are able to participate and take ownership of this new programming that’s considered valuable and innovative. Talking to teachers and administrators at the Darunsikkhalai School for Innovative Learning, as well as researchers from Stanford, enabled me to see that teaching effectively and creatively with technological tools is challenging, regardless of geographic location. Often, the hardest barrier to overcome is a person’s individual reluctance to learn independently. Maker programming can be introduced through a simple workshop where all staff, from Executive level to the Maintenance Staff, are given the opportunity to design on their own, and play with the tools in a safe, supported, low-barrier environment. The solution to effective maker programming seems to be to get these tools not only into youth hands and mentor hands, but also into the hands of anyone involved in a youth’s educational nucleus, so that everyone starts to use computers and 3D printers the same way they would use a pencil or a lump of clay. The true innovation in libraries and museums occur when people are empowered and learning, not by collecting expensive equipment, but by sharing and supporting knowledge.